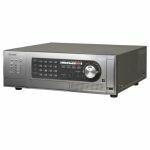 The WJ-HD716 16-channel Real-Time Digital Video Recorder (DVR) features a proprietary UniPhier System LSI Platform to provide real-time field recording of 480/400 images per second (ips) and frame recording of 240/200 ips, and H.264 compression technology for more efficient use of disk space. - Intelligent Video Motion Detection (i-VMD) with Super Dynamic 5 Link (SD5Link) to share metadata information between cameras and the recorder. - Dual HDMI video outputs for true 1080i HD playback. - Four front accessible hard disk drive slots. - SD/SDHC memory card slot for easy copy of recorded image data. - Various display modes: 4/7/8/9/12/16 split screen display. - Up to 5 recorders can be cascaded for increased camera support.